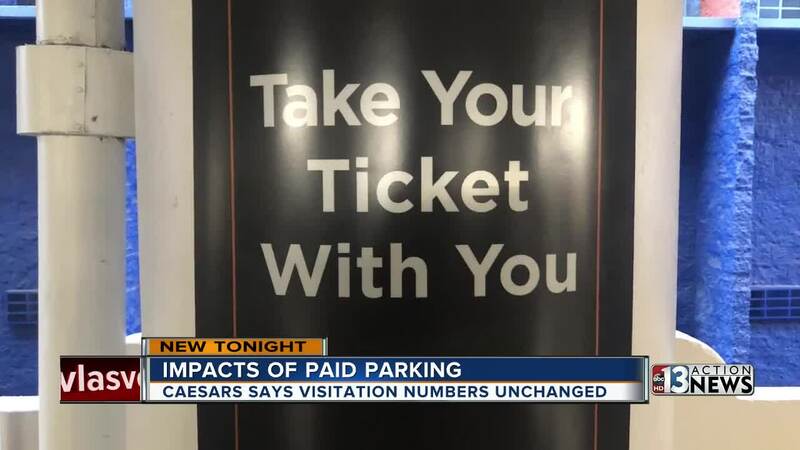 Caesars Entertainment is saying their paid parking roll out has not impacted visitation despite many people believing it would. A spokesperson for Caesars Entertainment says CEO Mark Frissora originally thought the fee might be over the top for visitors coming to Las Vegas. But it turns out, there has not been a drop in visitation numbers. Caesars Entertainment put it to the test in August by offering free parking at The LINQ for 30 days. They advertised it on their website and on other websites like Expedia. The spokesperson says it didn't matter. Visitation numbers remained consistent at the other properties throughout the trial period. People we spoke with on the Las Vegas Strip, however, still don't like the idea of paid parking. "We left the car parked in the Tuscany parking lot and now we walk everywhere we want to go," said one woman from Canada. "You're going to drop a bunch of money anyways so why not have more money to spend," said a man from Connecticut. Paid parking at Caesars properties has been in effect for almost two years.